The collections within The Met are owned by about 950 people that make up a private corporation of fellows and benefactors. The Metropolitan Museum of Art, colloquially “the Met”, is located in New York City and is the largest art museum in the Western Hemisphere, and is among the most visited art museums in the world. The Met is governed by a board that includes NYC officials, museum trustees, and elected members. Although a suggested admission fee of $25 exists, people can visit with as little as $0.01 if they cannot afford more. The Metropolitan Museum of Art was founded on April 13, 1870. The founders included businessmen and financiers, as well as leading artists and thinkers of the day. 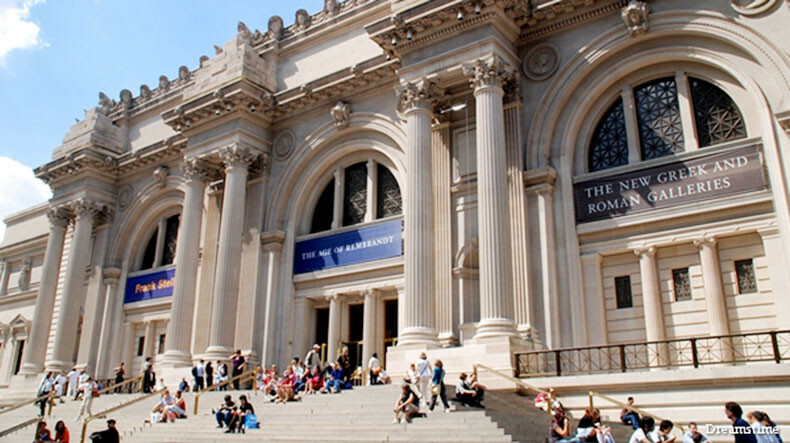 There are more than 6 million visitors to The Met each year. Since the Museum opened its doors to the public in its current location in Central Park in 1880, its footprint has expanded to cover more than two million square feet (185,000 square meters). The Met hosts concerts, classes, and other events and guided tours are free. Some of the famous artists whose work is on display in The Met include Vermeer, Raphael, Botticelli, Veneziano, Goya, Leonardo da Vinci, Degas, Michelangelo, Claude Monet, Vincent Van Gogh, Paul Cézanne, Paul Gauguin, Pablo Picasso, Henri Matisse, and Amedeo Modigliani. A much smaller second location, The Cloisters at Fort Tryon Park in Upper Manhattan, is dedicated to the art, architecture, and gardens of medieval Europe. On March 18, 2016, the museum opened the Met Breuer museum at Madison Avenue in the Upper East Side; it extends the museum’s modern and contemporary art program. The Met Fifth Avenue is one of the world’s largest art galleries and presents over 5,000 years of art spanning all cultures and time periods. There are four piles of uncarved stone atop the four columns on the front façade of The Met. These were originally meant to be sculptures but money ran out, and the stone piles remain today. They would have been sculptures representing the Egyptian, Greek, Renaissance, and Modern art eras. Approximately 400,000 pieces in the collections of The Met can be found online. Many images are available for use for non-commercial purposes. The permanent collection consists of works of art from classical antiquity and ancient Egypt, paintings and sculptures from nearly all the European masters, and an extensive collection of American and modern art. The Met maintains extensive holdings of African, Asian, Oceanian, Byzantine, and Islamic art. The museum is also home to encyclopedic collections of musical instruments, costumes and accessories, and antique weapons and armor from around the world. The ancient Egyptian hippopotamus statuette that is now the Museum’s unofficial mascot, “William,” entered the collection in 1917. There are more than 25,000 photographs in The Met's collection. The oldest items at the Met, a set of Archeulian flints from Deir el-Bahri which date from the Lower Paleolithic period (between 300,000 and 90,000 BC), are part of the Egyptian collection. The Robert Lehman Collection is a private collection at The Met donated by Robert Lehman's foundation after his death. It contained more than 2,600 pieces. The oldest work is an Iranian storage jar dating back to 3800 to 3700 B.C. In the fourth millennium B.C. in central and southwestern Iran, painted decoration on pottery like this large jar reached a new level of sophistication. The Met’s collection of musical instruments contain the oldest piano in existence, and one of only three that survive from the workshop of the inventor of the piano, Bartolomeo Cristofori. The antique instrument dates back to 1720. The Met is one of the largest museums in the world, and houses much more than just art. It contains paintings, musical instruments, weapons, historical objects, clothing, Egyptian art, and sculptures. The Department of Greek and Roman Art began with a Roman sarcophagus when the museum first opened to more than 17,000 objects. The Met is almost one-quarter mile in length. The smallest work is a 2.8-centimeter (1.1-inch) cylinder from ancient Mesopotamia that was used to stamp impressions on clay. The Met building is comprised of more than 20 structures that were added on over the years. The museum’s first accessioned object was a Roman sarcophagus, currently on display in the collection of Greek and Roman art. The Costume Institute contains more than 35,000 costumes and contains pieces from the 1400s to today. The Met’s collection of European paintings numbers around 1,700 pieces. This collection includes representative works from such masters as Vermeer, Rembrandt, Caravaggio, Raphael, El Greco, Goya, Gauguin, Monet and Van Gogh. The original Met building was not well-received and its design was redone and today measures 20 times the size of its original design in 1880. The European Sculpture and Decorative Arts collection is one of the largest departments at the Met, holding in excess of 50,000 separate pieces from the 15th through the early 20th centuries. Though the collection is particularly concentrated in Renaissance sculpture it also contains comprehensive holdings of furniture, jewelry, glass and ceramic pieces, tapestries, textiles, and timepieces and mathematical instruments. The Met contains two-million square feet of floor space. The Met’s Department of Arms and Armor is one of the museum’s most popular collections. The collection comprises approximately 14,000 objects, of which more than 5,000 are European, 2,000 are from the Near East, and 4,000 from the Far East. It is one of the most comprehensive and encyclopedic collections of its kind. At any time there are more tens of thousands of works of art and objects on display at The Met. separate “American Wing” building to display the domestic arts of the 17th–early 19th centuries opened in 1924; paintings galleries and an enclosed sculpture court were added in 1980. The Met was built in an area that was seen as undesirable, far from the wealthy mansions and paved streets of NYC. Approximately 400,000 pieces in the collections of the Met can be found online. evenings when large crowds can lead to long lines at the elevators. country’s royal family—produces five towering bouquets for the Met’s Great Hall. Floral arrangements are comprised of fresh, seasonal vegetation and can be as tall as 3 to 3.5 meters (10 to 12 feet). In 2016, the museum set a record for attendance, attracting 6.7 million visitors — the highest number since the museum began tracking admissions. Forty percent of the Met’s visitors in fiscal year 2016 came from New York City and the tristate area; 41 percent from 190 countries besides the United States.